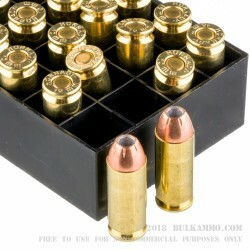 First conceived by the legendary Jeff Cooper and later brought into service by the FBI in 1989, the 10mm cartridge to this day has a loyal following that few other rounds will ever come to enjoy. 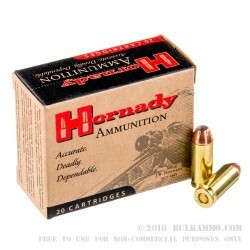 The Hornady jacketed hollow point 155gr 10mm ammo is the next iteration in the 10mm line of performance, and one of the preeminent 10mm self defense rounds on the market today. 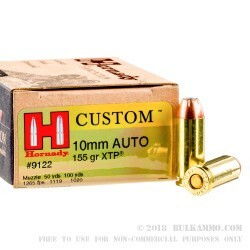 Engineered using Hornady’s patented Extreme Terminal Performance (XTP) bullet technology, Hornady 155 grain 10mm JHP ammo is the standard by which all high performance self defense ammunition is judged. 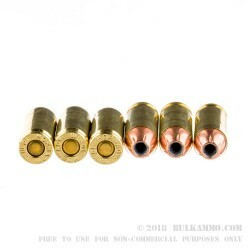 Utilizing a one of a kind crimped cannelure around the diameter of the bullet’s jacket ensures greater adhesion to the swaged lead core, and greater weight retention after impact and formation of the terminal cavity. The gilded metal jacket encopmases the entiretly of the lead core, and protects the round for malformation during ignition of the primer and subsequent acceleration down the barrel. Symmetrical serrations across the nose cone of the bullet’s jacket allow for a controlled expansion of the round upon impact, and exceed FBI protocol for all standards of penetration. While the 10mm itself is a force to be reckoned with, the Hornady 155 gr. 10mm JHP is a standard of performance that will continue to be unrivaled for years to come .